The gym at my school offers a great selection of fitness classes – everything from spin to barre to yoga. Since it’s been awhile since I last belonged to a gym, I’ve been taking advantage of all the class offerings. I’d never been to a Zumba class until a few weeks ago. I kind of feel like I was one of the only people left who had never been. But now that I’ve been to a couple classes I thought I’d share my thoughts and what to expect for anyone else who hasn’t gone before. First off, for some reason I thought the class was going to full of old people. I imagined people older than my mom. Maybe it’s because of the location (a university), but I was pleasantly surprised when I walked into the room and found people my own age. There were also people who were younger, in their 20’s, all the way to their 50’s. For the most part I like rock music. I’ll listen to the pop radio stations in the car for a song or two, but it doesn’t take very long before I’m back on one of the rock channels. I wasn’t sure if I would enjoy the Zumba music. Luckily I was wrong. While there is a lot of pop music, some of it was latin, and Vanilla Ice was also played a couple times which brought me back to elementary school. The music was catchy and kept me going at full speed. I also liked the fact that I felt more coordinated with the music. Not only could I see when I was supposed to step right, but I could also hear it. Trust me when I say I need as much help as I can get when it comes to coordination. Speaking of coordination, although I’m not much of a dancer, I really enjoyed Zumba. You go through the moves for each song at least a couple times, so I was able to catch on by the second time or third time. After that I felt like I knew what I was doing. We’ve done some of the same songs in different classes, so that helped too. The teacher was awesome and emphasized that Zumba doesn’t have to be perfect. She said that it’s all about having fun and getting in a great workout. She mentioned that if you find yourself going left when the rest of the class is going right, don’t worry about it. And that if something doesn’t feel good for your body improvise and do something else. Having “permission” to mess up or do something completely different made me feel a lot more at ease. To be honest I was surprised at what a great workout it is. Before I wasn’t sure how hard I would have to work, but by the end of the first song I was sweating. I didn’t bring my water bottle with me into the class (I left it in my locker) because I didn’t think I would need it. Big mistake because by the time class was over I was parched. After that first class I made sure to bring it in with me, and last class I went to I ended up drinking the whole thing by the time it was over. Don’t make the same mistake I did, and make sure you bring water bottle with you! To sum up, I enjoyed Zumba a lot more than I thought I would. The music was great, the choreography was fun to do while not being too hard, and the energy in class was awesome. Everyone was dancing their heart out on their way to a great workout. If you haven’t checked out a class yet, I’d definitely recommend it. What’s one fitness class that you’ve only tried recently that you think everyone else has done? Hi Fiona! I just stumbled upon your blog for the first time. 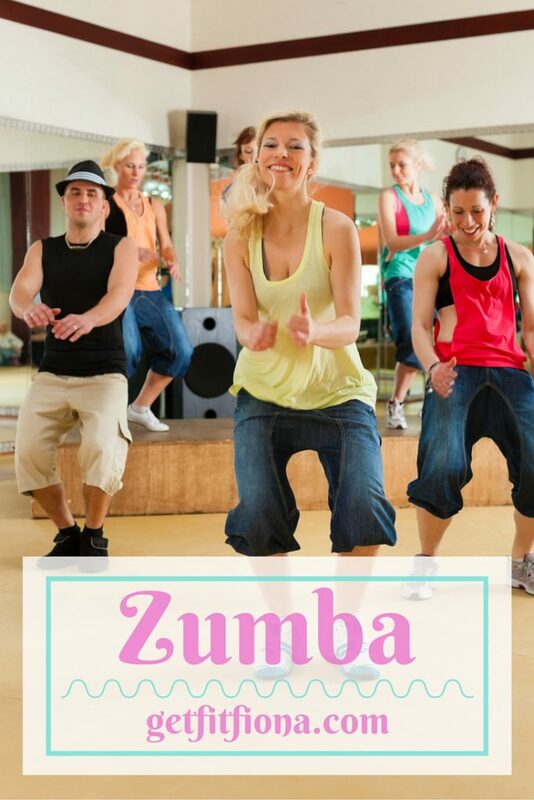 This post totally made me want to try Zumba again! Welcome to Get Fit Fiona! You’ll have to let me know if you end up going. It feels more like fun to me than working out.